I doubled the motor to 2 loops of 1/16". I added 1 gram of weight to the nose and took it out. The tail dropped and it stalled out. I added a second gram of weight to the front and it behaved a bit better, but still stalled out. 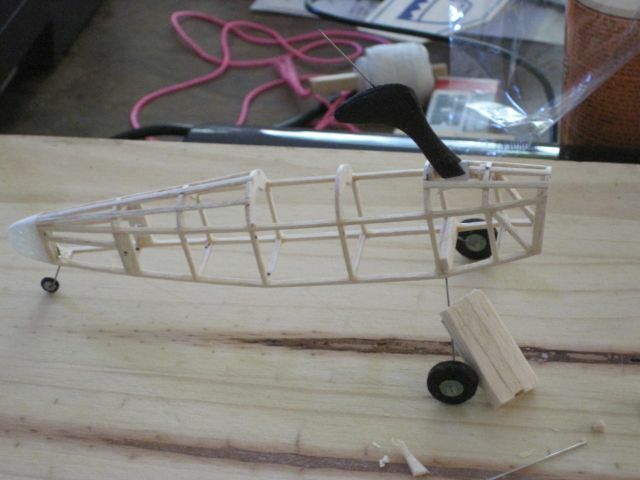 I have added a third gram of weight to the nose bringing the total weight, including rubber and prop to 11.4 grams. I haven't tried it yet. 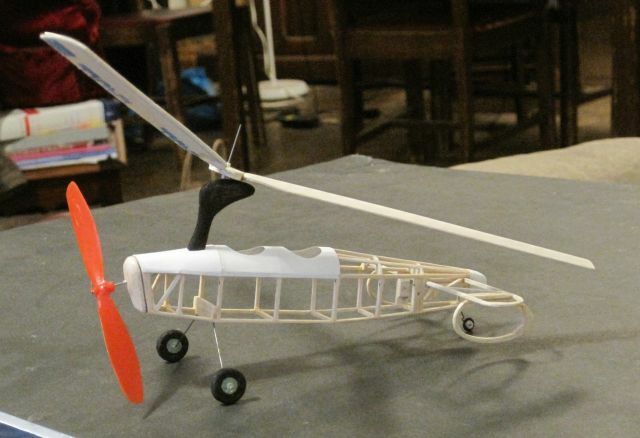 My thoughts are that a gyrocopter should end up with a longer nose to keep the final weight down. 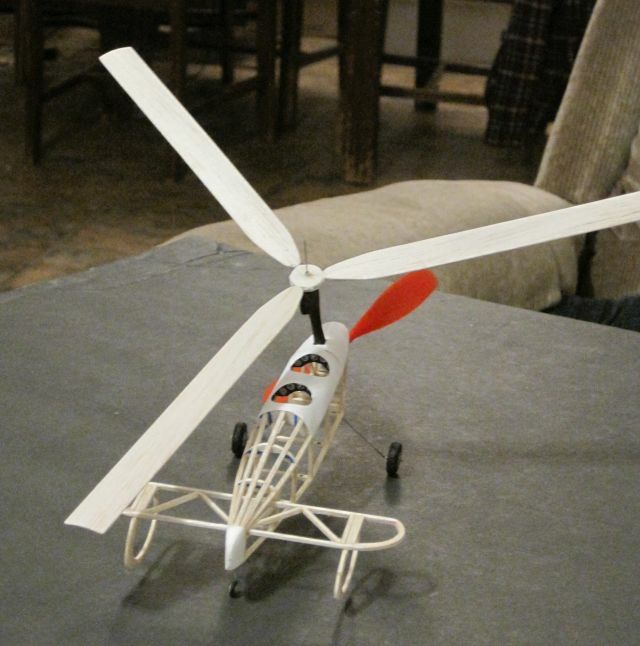 I put a loop of 1/16" in the gyrocopter and took it out for a test-run last night. Oh yeah, I had to add a bit of lead shot in the nose-block to balance it. There wasn't enough power on 300 winds. it turned in circles as it descended. I'll try again later with either 2 loops of 1/16, or something larger. 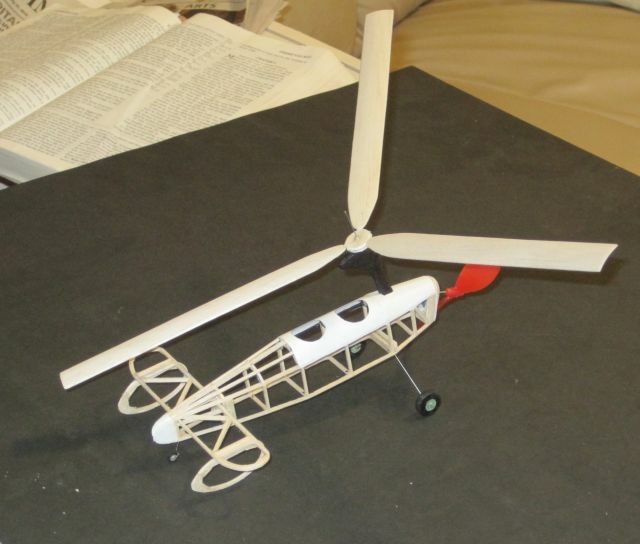 If that doesn't work, I'll try a 4 1/2 inch prop. 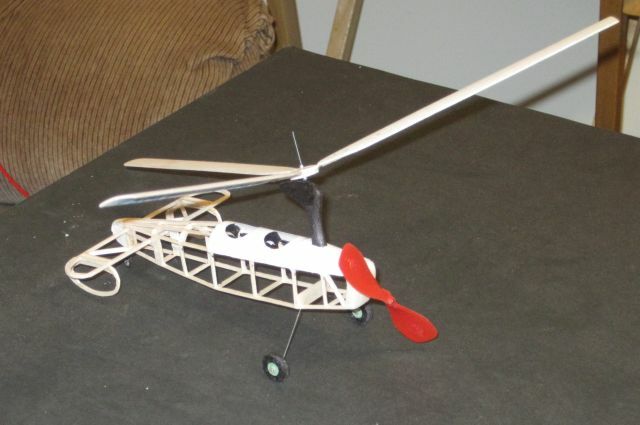 I was thinking, last night before drifting off to sleep, that if you take your cutting tool and add an additional blade, centered, embedded in the wood and sticking upwards that you could push the 1/8th balsa through and get two 1/16" sticks out the other end in one stroke. Me too Ian....I'm intrigued by this model and you building it from a hand launched/catapult launched glider kit sheet balsa! Amazing! That is really neat Ian, and came out looking very nice. 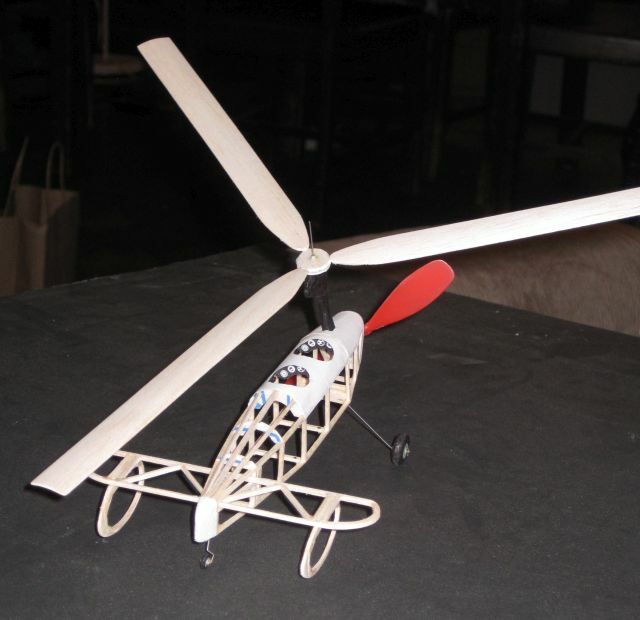 Once you've got comfortable with the rotor dance I'd love to see some video of it flying. Assembled, but not quite finished. I need a new printer cartridge to print out roundels for the sides. 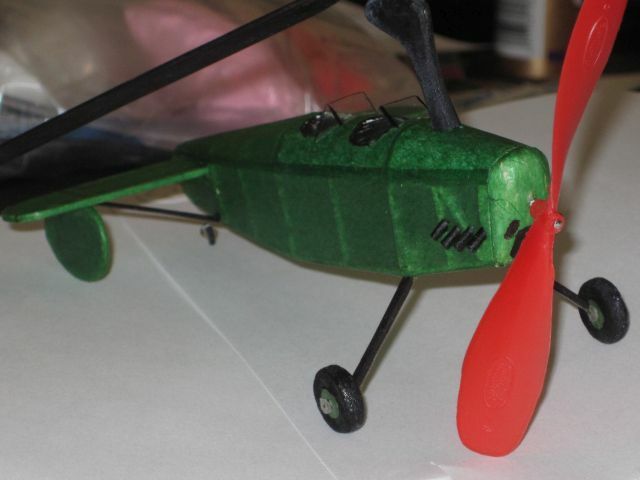 It takes that 1.25 gram prop out front to get the balance correct on the model. 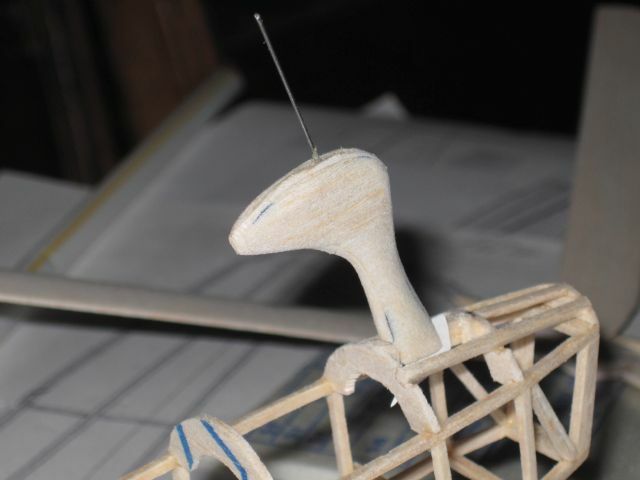 The (4) tail struts and landing gear legs are from scrap balsa from the glider kit and colored with a sharpie. 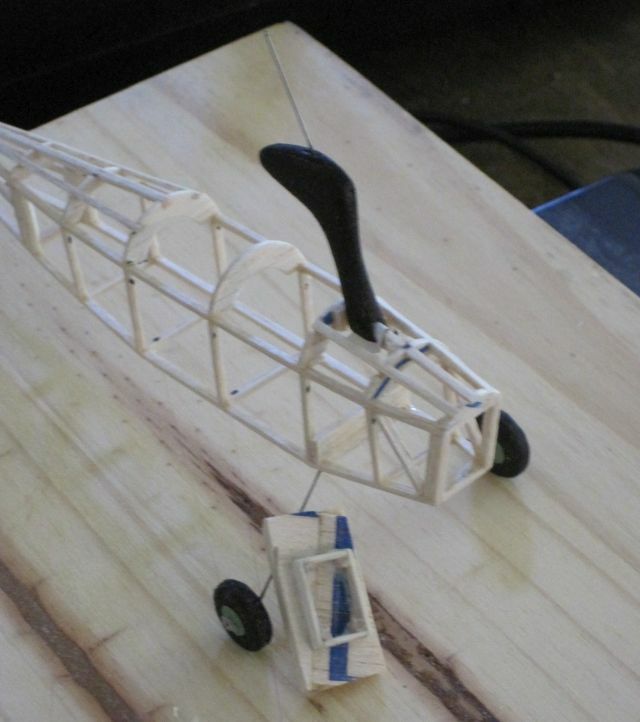 The landing gear is glued to the wire, but not to the fuselage. 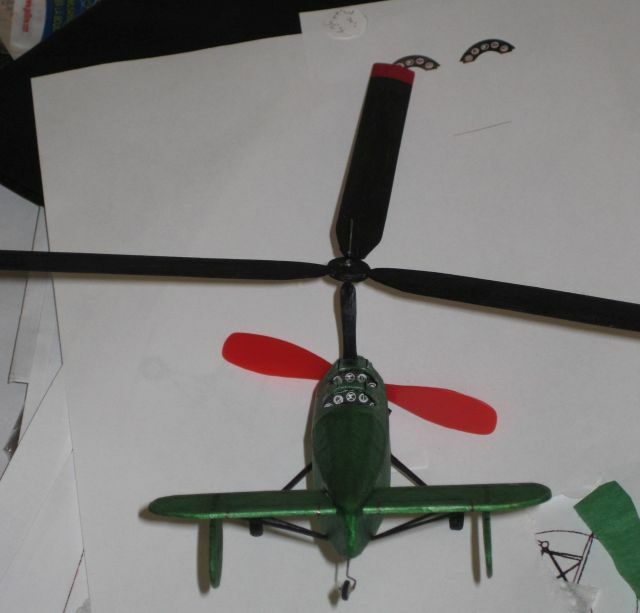 I used a glass bead on either side of the rotor hub. I haven't cut off the rotor wire just yet. I made a tissue tube from some black tissue and cut it up to make the exhaust stacks. Cutting them just at the right angle and length worked out somehow. Final weight is ... 6.95 grams. 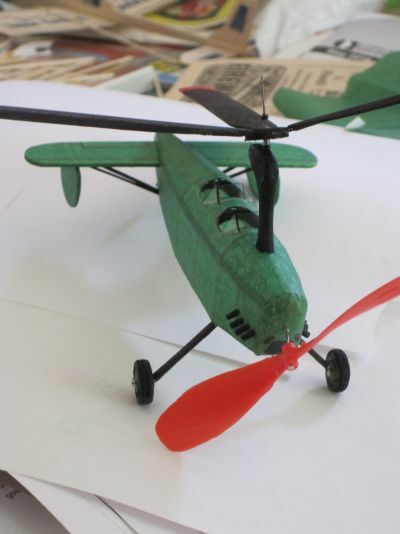 I did a couple of glide tests, just to make sure that it wouldn't just drop out of the sky. Getting the rotor turning properly is like doing some kind of a dance move before doing the release. The model does turn as it 'sort-of-glides'. I'll leave power tests for some later date. Don't feel like doing the 'last rites' just yet. Looks good....and a real treat for your wifey!!! 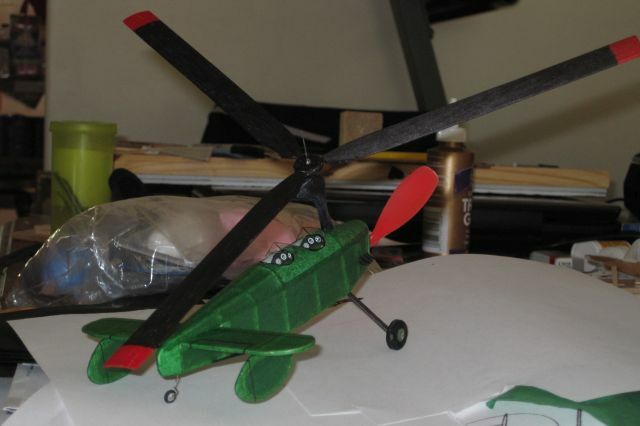 Just a teaser shot of the project covered with green domestic tissue to keep the interest going. 2 coats of clear Krylon. Pinned down to dry. Rotor painted with a red and black sharpie. 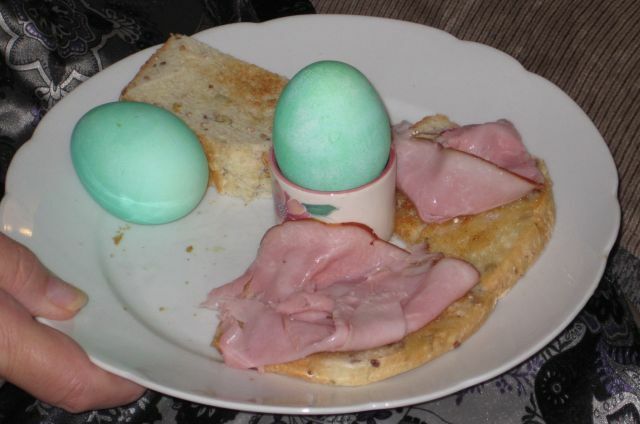 This morning, my wife asked for eggs with some ham for breakfast, so I decided to go Dr. Seuss on her. Pic of the result here. Here are the bones shots before I start covering. 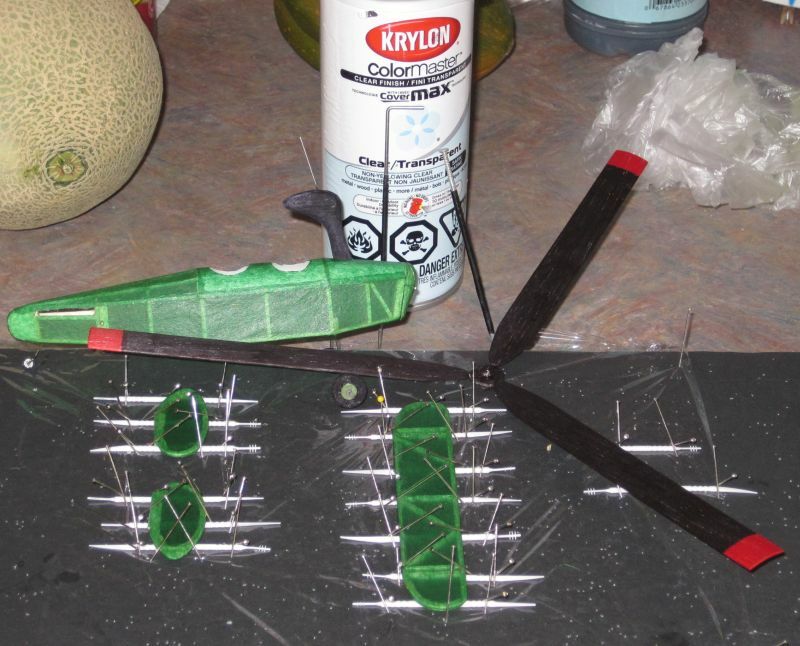 Weight: fuselage 2.5 g, tail feathers 0.45 g, Rotors 1.6 g. Assembled, including 4" guillows prop is 5.75 grams. I decided to put some light bond paper over the front section to increase strength in this area. By the way, the original weight of wood in the kit was 6.4 grams. WoW Ian...that mast is a work of art! This model is looking great. 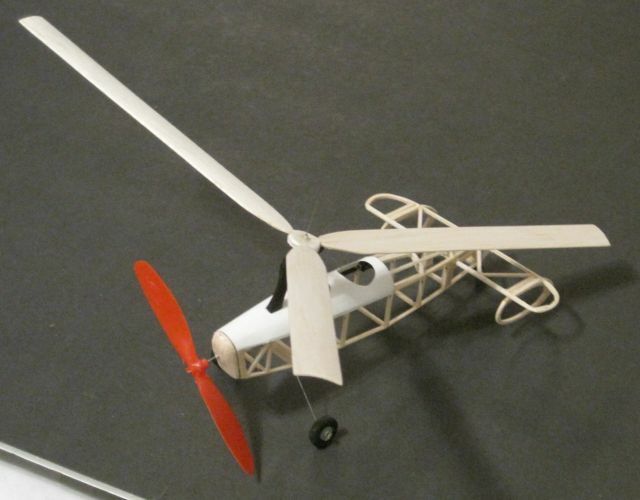 May just have to build an autogyro one of these day! Coming along and looking good. Working on the mast. The blank is 4 layers. For the outsides, I had to edge glue a few pieces. I finished the mast with a black sharpie and it is wedged into place for the pic. 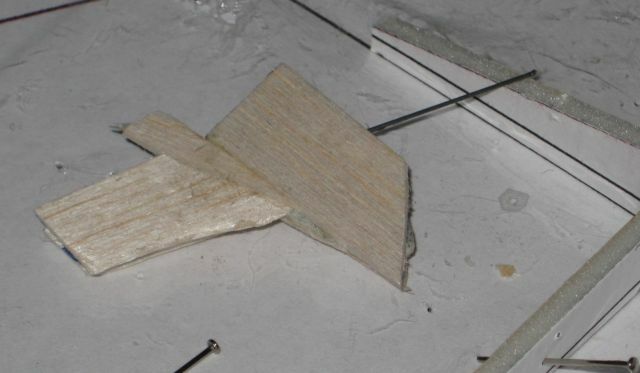 The Noseblock is similarly made of edge-glued pieces and is ready to sand to shape. Not much left in the way of wood now. 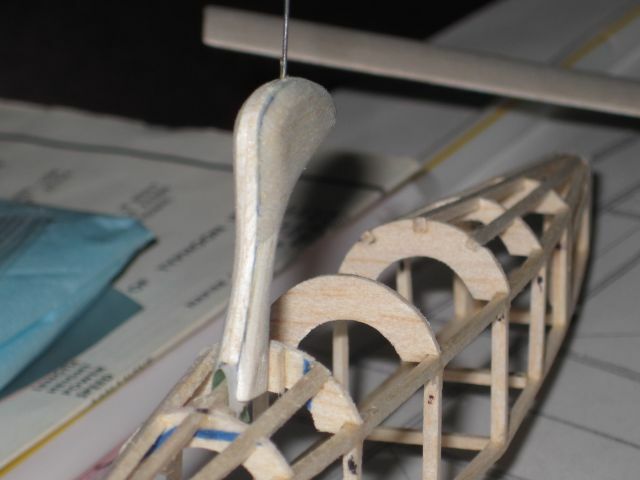 I have a couple of strips for the tail struts held in reserve.